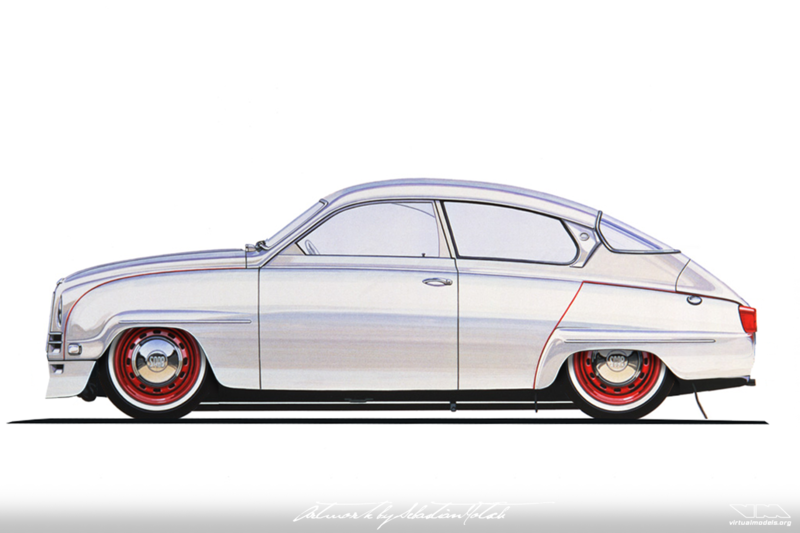 This SAAB 96 has been modified, but appears to be rather subtle. Lowered, bumpers deleted, bigger diameter wheels with white wall tires, a top chop and custom front spoiler make it look a lot sportier. 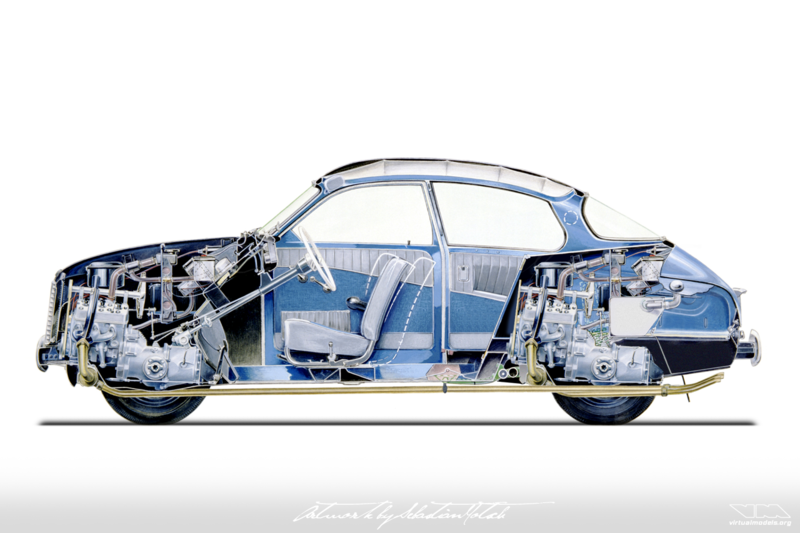 Can you imagine a second engine in the boot, as in my recently finished SAAB 96 Tvillingmotor? 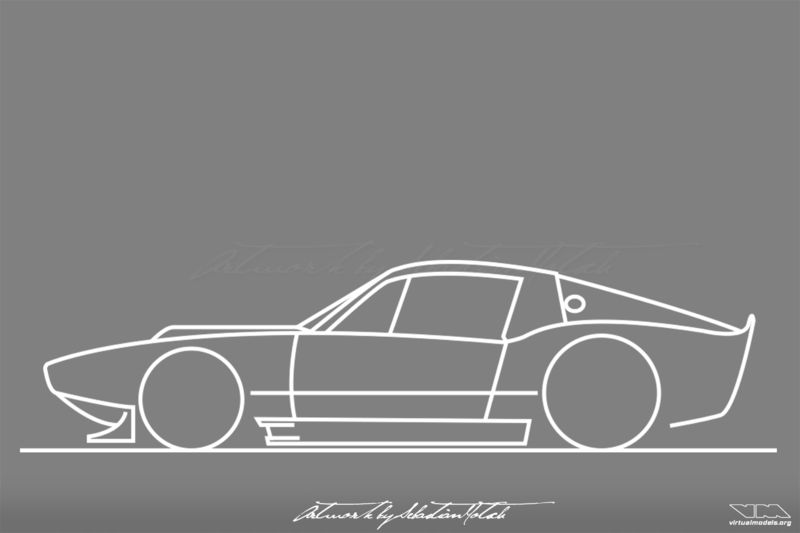 I have always loved the shape of the SAAB Sonett I roadster, but similar to the BMW 507 I never liked the stance and choice of wheels. Diameter too large, tires too skinny and a stance that would suit a 4×4 – not my cup of tea on a roadster intended to be driven hard. Fixing these three problems is exceptionally rewarding on many cars from the 60’s and 70’s, because the designs are often adorable. 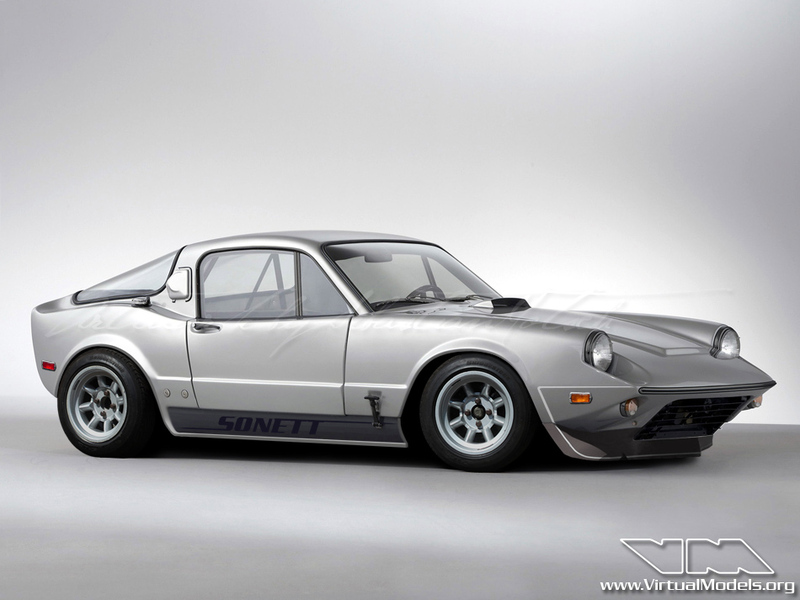 Apply this recipe to a first generation SAAB Sonett, add a set of American Racing Torq Thrust wheels and tires with white lettering on the sidewalls. 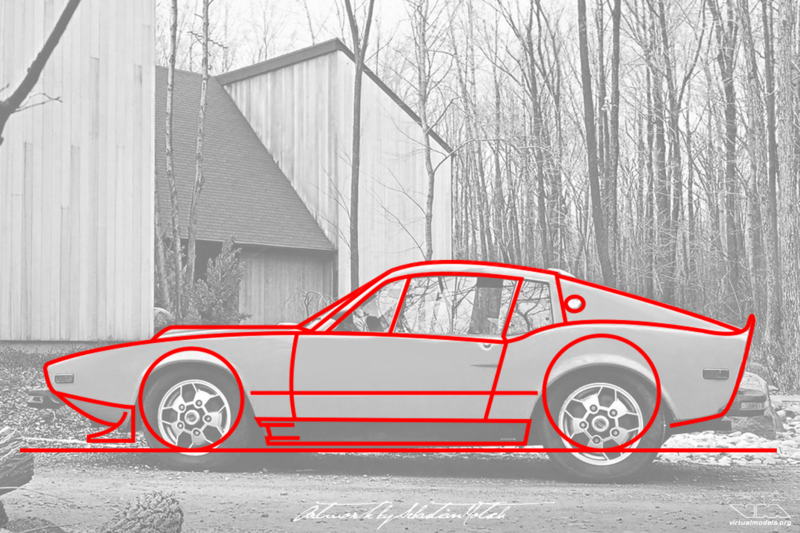 Voilà, you have a roadster that it still tiny and nimble, but looks like it packs a lot more punch. Todays lunchbreak challenge: something nobody in his right mind would attemopt to do for real. 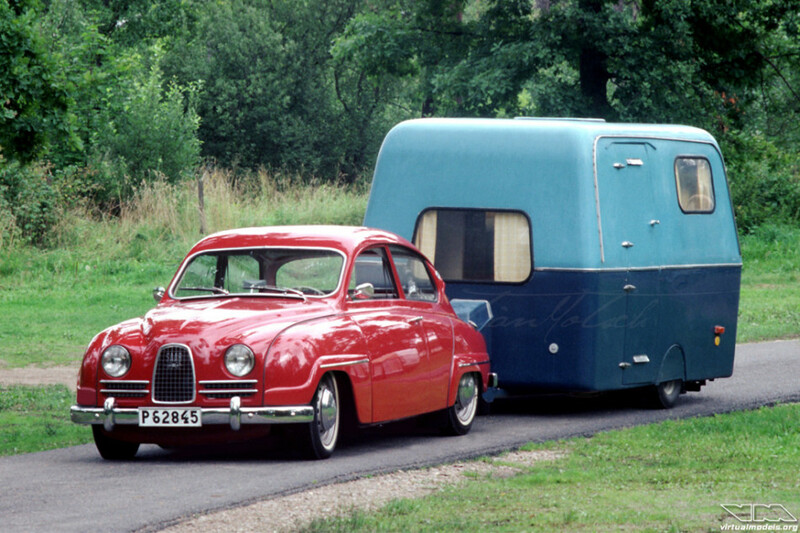 A SAAB 96 with twin engines, similar to the famous Citroën 2CV Sahara. All done and finished in 45 minutes, but I still need to add the shift linkage and the throttle cable. It’s impossible to add these details in the given timeframe. SAAB went out of business in 2011, which made me sad because I always liked the odd and sometimes even weird Swedish cars. 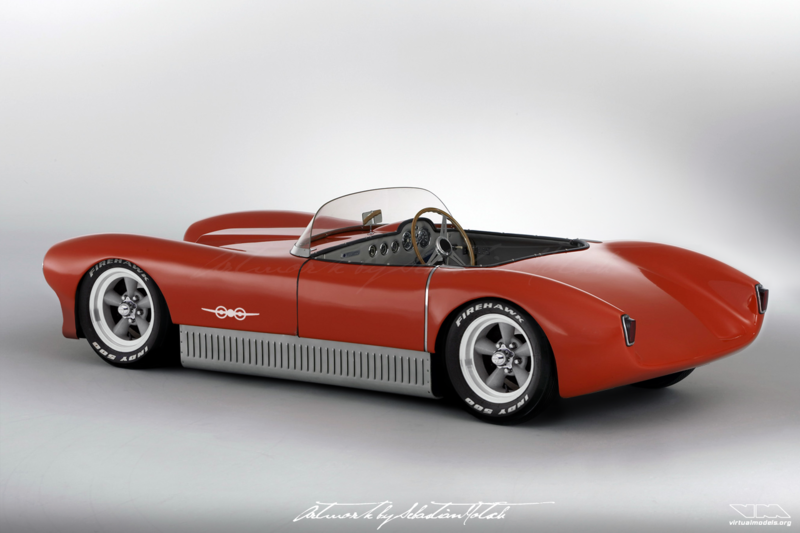 Especially the vehicles developed before GM bought SAAB had something that made them unique and therefore special. 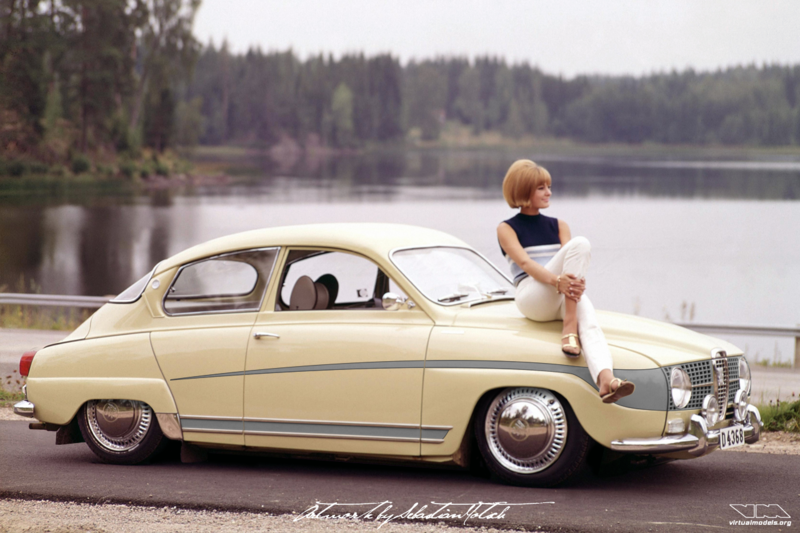 SAAB customers of yore have been very loyal and enthusiastic about their brand. 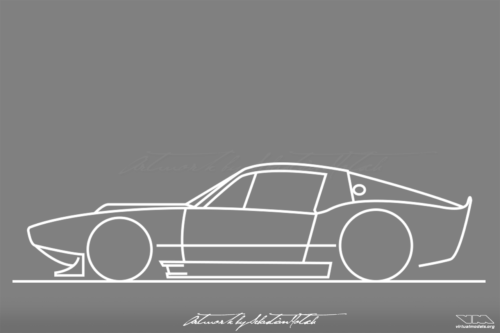 Instead of building small amounts of special cars for customers willing to pay more for a SAAB than for any other car, GM watered down the design in order to make the cars appeal to more mainstream customers. The idea of selling more vehicles that way didn’t work out too well, did it? Rightly so, because most people thought the vehicles were not special enough for the price asked. 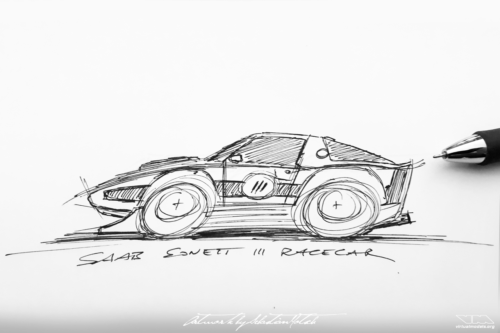 If customers want to drive a car that makes them stand out of the crowd, it doesn’t really make sense to design cars that appeal to a broader audience. 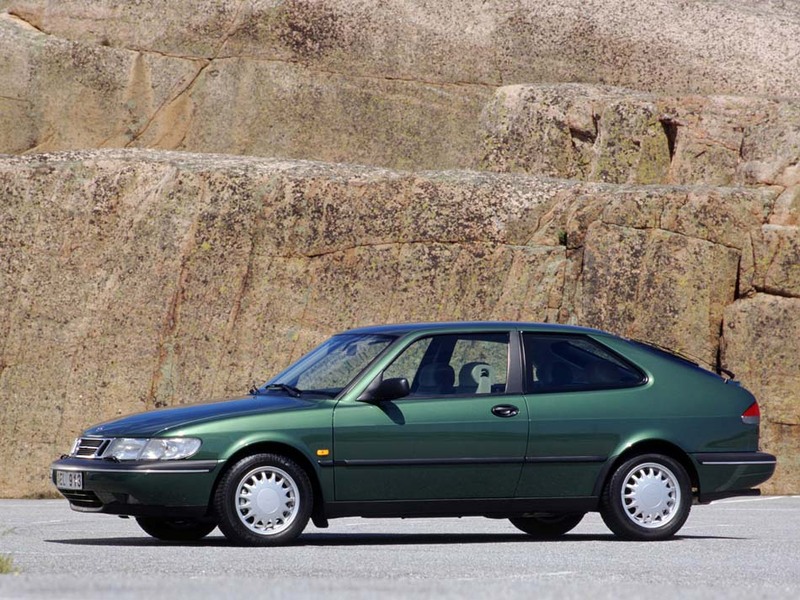 The decline of the SAAB brand was slow and painful for enthusiasts. Late in 2011 it was finally over. 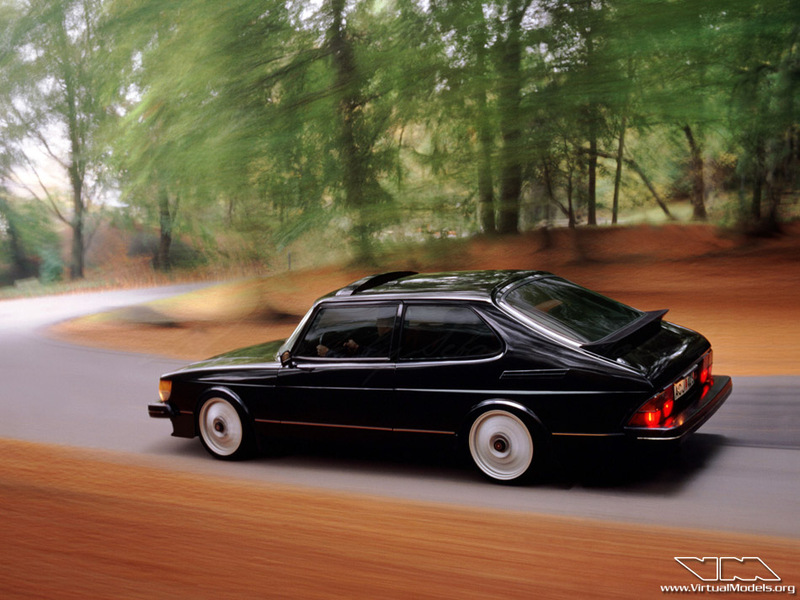 SAAB – rest in peace. Green really isn’t my favorite color. 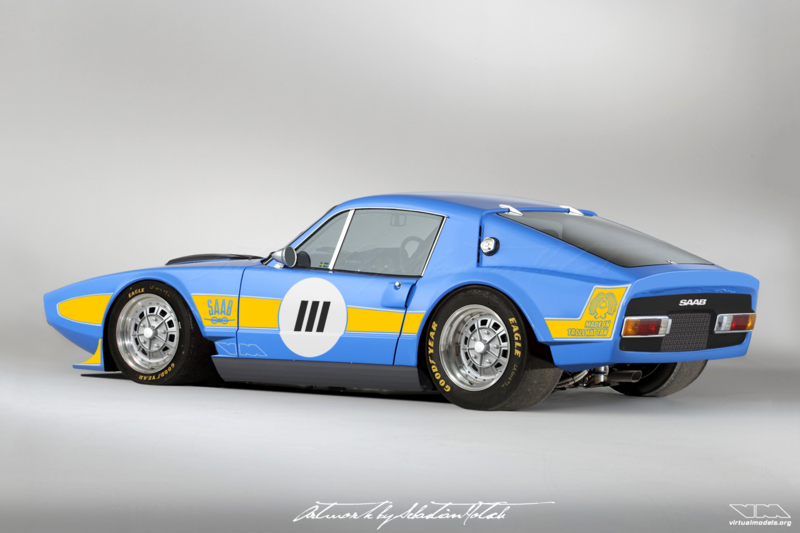 A high ride height on a roadcar isn’t as well. 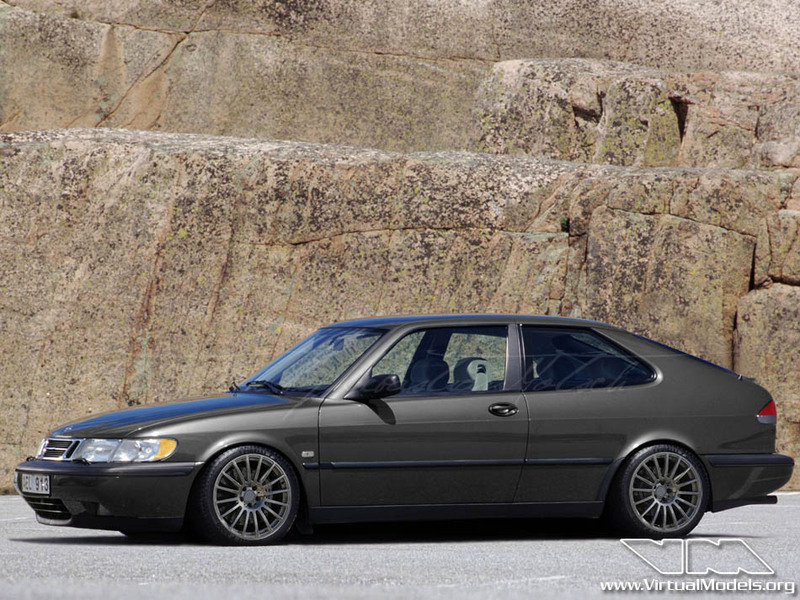 Altering some of the pixels in the original picture brought me to the nice SAAB 9³ you see here. Wheels have been borrowed from a Mercedes-Benz CLK AMG Black Series.